Dr. Charles F. Mahl is not only the Medical Director of GenLife Regenerative Medicine in Coral Gables, but also a remarkable specialist in Interventional Orthopedic Regenerative Medicine (IROM). Additionally, he is the workshop development director at AAOM IROM Hands on Workshops. Dr. Mahl has over 20 years of experience in the field and for 3 years was the mentoree of Dr. Alvin Stein, one of the foremost prolotherapists and well-respected orthopedists in the United States, in the art and science of Prolotherapy, Platelet Rich Plasma (PRP), Regenerative Medicine and Non-surgical Orthopedics. He has experience as an active member of the Interventional Orthopedic Foundation, taking part in the Wounded Warriors Program for soldiers and veterans. As a member of the American Association of Orthopedic Medicine (AAOM), he has: participated in their medical missions with the American Osteopathic Association of Prolotherapy and Regenerative Medicine (AOAPRM); and he has lectured and proctored other physicians in Regenerative Medicine. 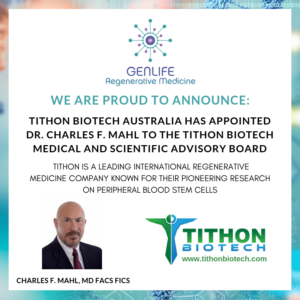 Dr. Mahl is a member of numerous other professional organizations within the fields of pain management, regenerative medicine, and anti-aging medicine, whilst serving on the medical Advisory Board of numerous Stem Cell companies, where he works on assessing and developing new products and techniques. Now Dr. Mahl would love to share his professional expertise, knowledge, experience, and skills with other physicians throughout the world in Regenerative Medicine. Here is more information about Dr. Charles Mahl and his career. The workshops are designed for doctors who would like to gain more knowledge about the use of orthobiologics as an effective treatment for many orthopedic conditions. Training will concentrate on IROM treatments and injection techniques for the hip, knee, pelvis, shoulder, ankle/foot, and elbow/wrist/hand. If you are a physician who wants to progress in: knowledge and skills utilization and guidance; ultrasound and fluoroscopy for orthobiologic treatments, including PRP and stem cells; and other injectable treatments, then the workshops are for you! 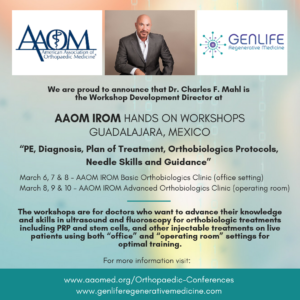 The AAOM IROM workshops, including all mentioned treatments will be performed on live patients using both “office” and “operating room” settings. If you would like to learn more about non-surgical treatment options for pain management in Miami, please contact us!